After reading Ki’s review of Enchanted Leaves, I was curious and decided to browse the etsy shop to see what other stuff they had, as animal jewellery isn’t really my thing. Holy crap!!! I really want this. 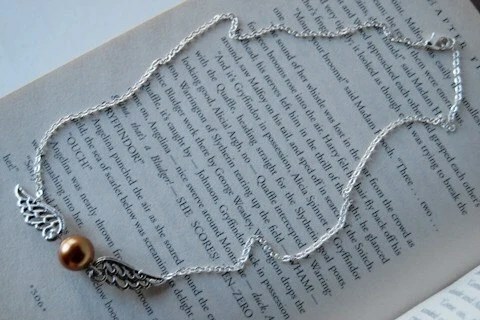 I really, REALLY want this. It’s called Seeker’s Quest! Oh man, a golden snitch!!! How cool is the name?! This doesn’t seem like a big deal, I know. In fact, this is not exactly an intricate or fancy piece of jewellery. However, Harry Potter fans will understand why I squealed in excitement when I first saw this. Anybody who knows me knows that I am a HUGE Harry Potter fan. HUGE. No, not the movies. Those are fake fans. The books are just so wonderfully thought out, and I am still spotting new things in the books when I go back to re-read them. They are amazingly complex for a kiddy book series, and I love how the author, J.K. Rowling changed the way the book is written, as if to suit her readers who literally grew up with Harry Potter. The first book was written for someone between the ages of 7-11, probably, and the last book was definitely adult material. Words cannot express how I feel. Thanks Ki. 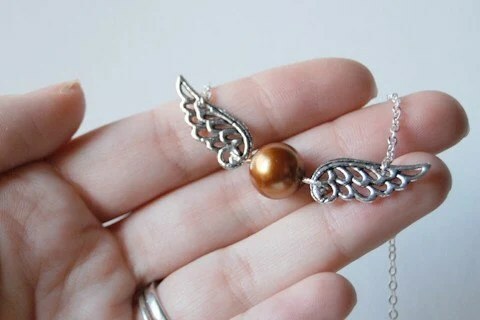 I just sent an email hoping the owner would make me a pair of Golden Snitch dangly earrings for my birthday. I’m a one necklace kinda girl, and I don’t ever take off the diamond necklace that was given to me for my 21st birthday. I’m obsessed with dangly earrings and this will make a good I-love-me-so-much present! Aww that is so adorable! 😀 I am so glad I helped you find something you like so much! The pendent is really cute!! Nice to meet you! I’m in talks with the company regarding the design of a pair of Snitch earrings, I hope they turn out beautifully.